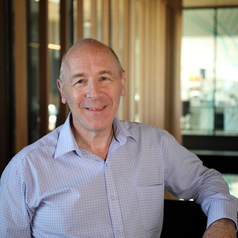 Ian Olver graduated from the University of Melbourne in 1976, completed an MD in 1991 on clinical trial methodology and a PhD from Monash University in bioethics in 1997. He trained in medical oncology at Peter MacCallum Cancer Institute, the Alfred Hospital in Melbourne and the University of Maryland Cancer Centre in Baltimore. After serving as Clinical Director, Royal Adelaide Hospital Cancer Centre, where he currently holds an emeritus appointment, and becoming the first Cancer Council SA Professor of Cancer Care at the University of Adelaide, in May 2006 he was appointed CEO, Cancer Council Australia and received their Gold Medal in 2014. He is an Associate Professor in the Centre for Values Ethics and the Law in Medicine at the University of Sydney. In 2015 he accepted an appointment as Professor of Translational Cancer Research and Director of Sansom institute for Health Research which has now become the University of South Australia cancer Research Institute. He currently chairs the Australian Health Ethics Committee of the NH&MRC and serves on NH&MRC Council. He has published over 290 articles in journals, 19 book chapters has written 4 books and edited three others. In 2008 he was awarded the Cancer Achievement Award by the Medical Oncology Group of Australia and in 2011 received an AM for services to oncology.